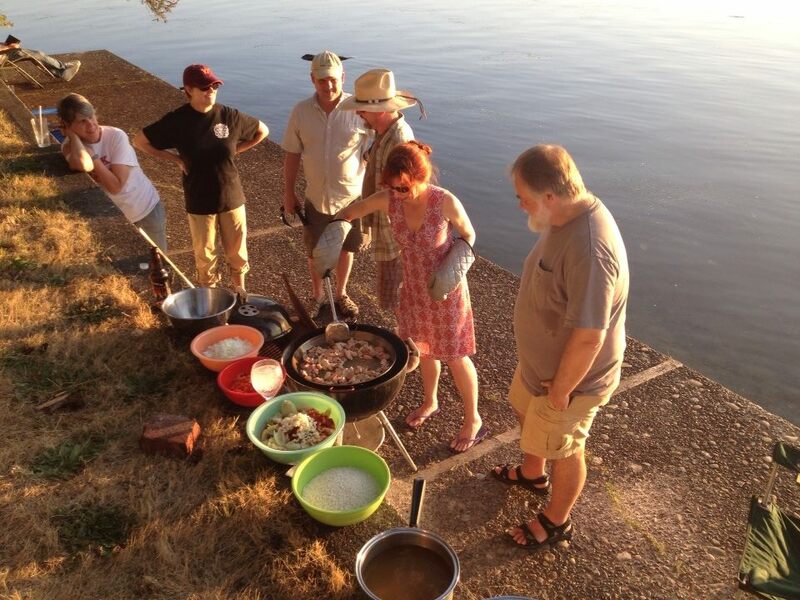 My go-to dish for summer BBQ-ing is paella, as everyone enjoys standing around the barbecue, watching it cook. My version is a combination of a few different recipes, and you can vary the ingredients based on what you have on hand. Ideally, a crunchy rice crust should form on the bottom of the paella. Heat chicken stock with saffron. In an 18” paella pan, heat olive oil. Add chicken and chorizo, and cook until no raw spots are visible in the chicken. Add onions and bell pepper, and cook until softened, about 5 min. Add garlic, tomatoes, smoked paprika, and salt, and cook about 5 min. Add rice and stir until all rice is coated. Add hot broth, peas, and artichokes, stirring gently and smoothing out solids into an even layer. After that, do not stir at all. Leave it be. Let cook until most of the liquid is absorbed. Spread shrimp and scallops over the top of the paella, and gently press them into the rice with a spatula. Decorate with strips of roasted bell pepper. When the shrimp look on the verge of being completely cooked, remove pan from heat and cover tightly with tinfoil. Let rest for 10 min.